An Institute of Technology Carlow graduate has launched a range of school and sports bags designed with her partner to help improve the lives of the children of Ho Chi Minh city in Vietnam. Anne Marie Greene (28yrs) and her partner Ian Kelly (26 yrs), who are both from Bray, have launched DUC, a range of colourful junior bags, schoolbags and sports kit bags with the aim of creating opportunities for vulnerable Vietnamese children. Working in partnership with the Christina Noble Children’s Foundation, DUC - a shortened version of the Vietnamese word for education, giáo duc - is a one-for-one business model that pays for vaccinations, school kits and local swimming lessons. Drowning is one of leading causes of mortality among children in Vietnam with 32 children dying from drowning every day in the country. Anne Marie’s and Ian’s involvement with the children of Vietnam began in 2012 when Ian was on a six-month work placement with a furniture designer in Ho Chi Minh City. An honours degree graduate in early Childhood Education & Care from Institute of Technology Carlow, Anne-Marie joined him for four months and volunteered with the Christina Noble Foundation in Vietnam. Her childcare skills were put to good use as she worked with kids from two months to six years of age, visiting the social and medical centre, accompanying children to hospital appointments and witnessing first-hand the incredible work carried out by dedicated care workers. Since 2012, Anne Marie and Ian returned to Vietnam every year for one month, using donation money to buy shoes, toys and school kits directly for the local children. Last August they decided to develop a one-for-one business model that would help improve the lives of young children, in partnership with the Christina Noble Children’s Foundation. Ian designed the DUC range, whose materials are sourced and made in local Vietnamese factories that provide safe and clean working conditions and where employees work social hours and earn a standard wage. The range comes in a variety of bright colours and designs. “DUC is not about a bag, it’s about a mission. I believe that if more companies adopted this particular business model, collectively we can make a huge global difference”, commented Ian Kelly. 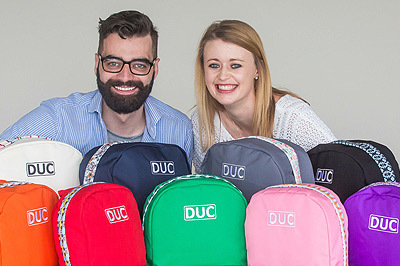 Pictured are IT Carlow graduate Anne Marie Greene and her partner Ian Kelly, founders of DUC, a range of colourful junior bags, schoolbags and sports kit bags with the aim of creating opportunities for vulnerable Vietnamese children. Working in partnership with the Christina Noble Children’s Foundation, DUC - a shortened version of the Vietnamese word for education, giáo duc - is a one-for-one business model that pays for vaccinations, school kits and local swimming lessons. Drowning is one of leading causes of mortality among children in Vietnam with 32 children dying from drowning every day in the country.